In August 1917, near Lens, France, members of the Canadian Corps fought for ten days against five divisions of the German 6th Army. The Canadian operation to secure Hill 70 was months in the planning. It was planned to draw German resources and attention away from another strategic target – Passchendaele. At tremendous cost to the Canadians, Hill 70 was secured. 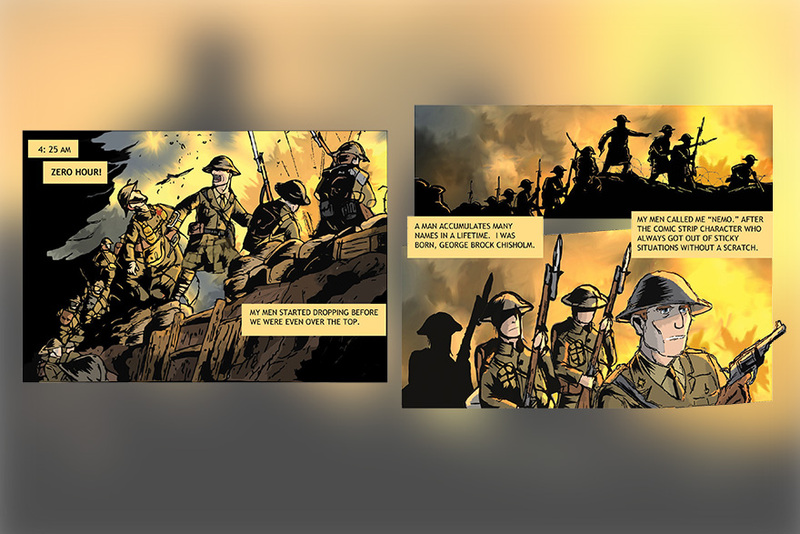 The Battle of Hill 70 graphic novel is told through the eyes of Lt. Brock Chisholm, who, in August 1917, led the platoon of the 15th Battalion on an an assault on Hill 70. In 2015, historian Robert Engen (RE) began working with the Hill 70 Memorial Project to help with its education kit to be distributed to Canadian high schools. Dr. Engen wrote a monograph,The Lads in Their Hundreds, to be included in the kits. He then recruited Matthew Barrett (MB), a fellow historian and illustrator, to collaborate on another initiative, a graphic novel, to tell the story of Hill 70 in a visual way. They chose to tell the story through the eyes of Lt. Brock Chisholm, who led a platoon of the 15th Battalion on an assault on Hill 70. MB: We wanted to feature the story of a young Canadian who participated in the battle but who is better known for his later achievements and contribution to Canadian history. Chisholm served as director of medical services for the Canadian Army in the Second World War and became the first director-general of the World Health Organization in 1948. Tracing Chisholm’s career back to its start at Hill 70 served to highlight the formative role of the battle in his and other veterans’ lives. RE: We relied heavily upon some of Chisholm’s own accounts of his war service (including a letter to his father about what happened at Hill 70), and ancillary records of what his unit was doing in the battle to fill in the blanks. There is a huge body of research that has been assembled on the Battle of Hill 70 now – Doug Delaney and Serge Durflinger’s recent book from U of T Press,Capturing Hill 70, is the most visible, but we also have countless war service records and unit war diaries from the battle that were acquired for the writing of The Lads in Their Hundreds. MB: We decided that the book would tell the story of Chisholm’s experience through the arduous first day of the battle on Aug. 15, 1917. This approach let us focus on the personal perspective of a junior officer from the platoon level. At the same time, focusing on an individual experience also meant that we couldn’t include many other equally interesting stories and unique details from the battle. For instance, the heavy use of mustard gas and liquid fire during the later stages of the ten-day battle would have made for powerful visuals. MB: Each individual panel goes through several stages from conception to completion. After working out the layout, I draw each picture by hand and then scan the images for digital colourization. Shading and shadows are next added to create dimension and depth. The important addition of lighting and highlighting serves to create the final scene. The entire art portion of the project took me about three months to complete. One of the most striking panels, cutting away from the action of the battle, shows the soldiers first training on taped courses, then moving through the same route in the trenches. RE: The plans for the attack on Hill 70 were first formulated around May of 1917 and intense training of the assault divisions of the Canadian Corps for the attack began in July. Not all of Canada’s battles in the First World War were fought with such meticulous planning, but Hill 70 certainly was and involved planning on nearly the same scale as the assault on Vimy Ridge in April 1917. Hill 70 was intended to pull German forces into a fight away from the main battle that was then raging at Passchendaele in Belgium, and was never intended to be a decisive breakthrough attack. That meant that the staff officers of the Canadian Corps could plan the assault in a comprehensive manner. Given the toughness of the German defences and the nature of trench warfare, the better your staff planning process, the more of your soldiers’ lives you would save once the fighting started. RE: One of the more surprising discoveries of the First World War was how useless artillery was for physically destroying positions, or for killing or wounding troops who were “dug-in” and protected in entrenchments. You could fire artillery at positions for days, or even a week, and not completely destroy it. Artillery was very good, however, at forcing enemy soldiers to stay in their trenches, and not poke their heads out to, say, put up a fight against Canadian approaching troops. The point of the creeping barrage was not to destroy enemy positions, but to minimize the time between when the shells stopped falling above enemy soldiers’ heads and when they felt safe enough to come up out of their bunkers. If Canadian troops were coming in very, very close behind the edge of a barrage of falling shells, then they could be into the enemy trenches before the defenders had a chance to properly array themselves. RE: The creeping barrage was first used in some small ways in 1915, and was developed as a key tactic during the six months of the Battle of the Somme in 1916, with the Canadian Corps taking a particular interest in it as a tool. It was an innovative approach to trench warfare, but was not a very flexible tactic. It required a colossal amount of planning, staff work, and organization in order to work properly: you had to coordinate between infantry movement on the ground and the fire of the artillery, when there often were not reliable communications between the two. So the artillery would have to “shoot” the infantry in largely blind, and according to a pre-arranged movement timetable (say, the artillery barrage moving ahead 100 yards every five minutes) to which the infantry would need to adhere. If the infantry fell behind the timetable, then they would be left behind by the barrage and potentially exposed to enemy fire. If the infantry went too fast, they would walk straight into a falling curtain of their own shells. So the creeping barrage was a potent tactic for the Canadians in both world wars, if they had the time to plan it out properly, but it was a brittle and potentially dangerous tool! MB: Victory at Hill 70 signified a major achievement for the Canadian Corps as the battle witnessed the first time that its four divisions went into a battle planned and commanded by a Canadian senior officer, Lieutenant-General Arthur Currie. While victory did not fundamentally alter the course of the war at the time, it represented a much needed tactical success for the Allied war effort and forced the Germans to divert vital resources from theBattle of Passchendaele. Currie, who had challenged British Field Marshal Douglas Haig when he persuaded superiors to follow his plan of attack against the German position at Hill 70 rather than the town of Lens, understood the high price of potential failure. A costly loss at Hill 70 might have threatened the hard-earned reputation enjoyed by the entire Canadian Corps. An unsuccessful operation may have also had political consequences back home as the Canadian Parliament had controversially enacted conscription shortly after the actual battle. The demoralizing effect of a defeat in such circumstances might have further destabilized a nation already starkly divided by the debate over compulsory military service. It is true that the Battle of Hill 70 has been overshadowed by Vimy Ridge in the popular consciousness, but this was not always the case. After the war, Currie himself commemorated Hill 70 as “the only battle honour which the Canadians share with no one.” People at the time and many veterans not long after the end of the war often pointed to Hill 70 as their greatest collective achievement. Memory of the battle faded after the construction of the famous monument at Vimy Ridge and the veterans’ pilgrimage to the site in 1936. While a significant battle in its own right, Vimy Ridge had been selected as the monument ite more for geographic suitability and public access than historical importance. 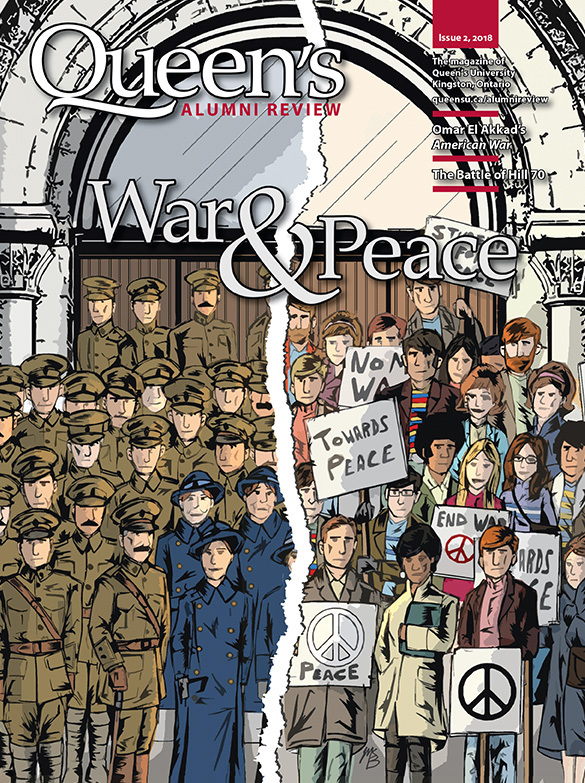 MB: As the graphic novel forms part of a wider education package, we felt it was important to emphasize the invisible psychological injuries suffered by countless First World War soldiers and veterans. Ending on a personal note not only emphasizes the brutal conditions under which Canadian troops achieved their victory, it also points to the hidden casualties of war. Robert Engen, MA'08, PhD’14 (History) is a military historian and assistant professor of history at Royal Military College. He is the author of Canadians Under Fire: Infantry Effectiveness in theSecond World War and Strangers in Arms:Combat Motivation in the Canadian Army, 1943–1945, both published by McGill-Queen’s University Press. Dr. Engen and Mr. Barrett are collaborating on a sequel graphic novel for the Hill 70 project that focuses on the experience of Frederick Lee, a Canadian soldier of Chinese ancestry. As we were preparing this story, the United States and its allies launched airstrikes against the Bashar al-Assad regime in Syria to punish it for its use of chemical weapons. As Dr. Engen points out, there are a few echoes of the First World War in those actions. RE: The great fear that we in the west have of chemical weapons, including their classification as weapons of mass destruction, is a legacy of the first world war. During the fighting, all sides developed both poison gases and countermeasures to protect themselves from poison gas. Chemical weapons were usually (with a few exceptions) just a nuisance to troops; very few soldiers died from gas, and it became just one unpleasant part of the stalemated war of attrition. The nature of chemical weapons is that they are indiscriminate and difficult to control. That mades them mediocre battlefield tools, even a century ago. But the first world war also pioneered the concept of aerial bombing and saw the first instances of strategic bombing of civilian populations. Italian air power theorist Giulio Douhet was one of the first to foresee the widespread use of chemical weapons, not against combat soldiers, who might be ready for them, but from the air against civilian populations, who almost certainly would not be prepared. The indiscriminate and difficult-to-control nature of gas makes it an extremely potent weapon if your target is a civilian population centre. all of this stemmed directly from the First World War. The second echo we can see is that Syria itself is a creation of the First World War. it is not a “natural” country: its long geometrical borders were carved out by the British and the French in 1916 in the Sykes-Picot agreement, which planned the partition of one of the Allies’ enemies, the Ottoman Empire. The origins of almost all of the conflicts presently underway in the Levant can be traced back to the disruption and displacement following the collapse of the Ottomans and the establishment of Western colonial rule in the region.